With the Mayoral election coming up, fares will be a burning hot topic. But there’s so much politicking surrounding the issue it’s almost impossible to separate the fact from the posturing. So we decided to put together some actual data that we can refer to the next time a candidate says “when you look at the fares increase in real terms / compared with inflation / I had my fingers crossed and it didn’t count”. 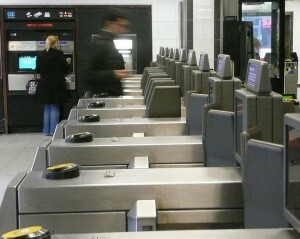 Not as easy as it sounds: until 2003, new fare proposals were published in TfL Board Papers. After that, as far as we can tell, the data disappear, with only select information in press releases, before returning in 2009 on the Mayor’s website – but only accessible by wading through search results. Thankfully, TfL were able to provide us with a full history for certain fare types. Direct comparisons aren’t always easy – we had the introduction of Oyster and removal of bus zones in 2004, and withdrawal of day travelcards for zones 1-3, 1-5 and 2-6 in 2011, for example – and so many permutations. But we’ve decided to look at travel between zones 1 and 4. Sorry to be a nerd, but RPI between 2000 and 2010 averaged only 2.7% per year/ 31% increase over 10 years (taken from the Bank of England- no data to 2012). All of these fare increases are well above RPI. There’s a graph here plotting fare increases against weekly earnings increases http://snipelondon.com/metropolis/those-tfl-fare-rises-in-handy-chart-form Some things are cheaper than they could be… but transport isn’t one of them For me the big question is, do the prices reflect the increasing value that everyone places on transport, alongside things like increasing value of having a nice house in a good location (possibly to avoid transport!) Certainly good transport is important and valuable. Perhaps prices are shifting to better reflect that …or are transport monopolies managing to hike prices unreasonably? It seems like we don’t have a very competitive transport market, so why wouldn’t they? These in graph form would be great! Hehe – challenge extended! Anyone? 10:36 AM | Jul 31, 2013 Where Are The Best Pubs In Queen’s Park And Kilburn? 12:30 PM | Jun 28, 2013 Where’s The Best Pub In Peckham And Camberwell? Click here to win great London stuff. Take a look at the fantastic, free-admission places to go to for culture, live entertainment and family-friendly activities in London. A weekly podcast about London, with N Quentin Woolf. Have you got our guide to the best London pub crawls? What Does The Shadow Minister For London Do?